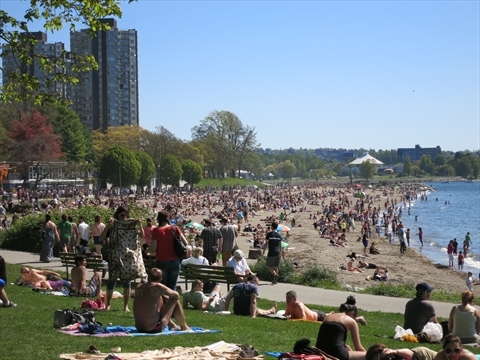 English Bay Beach (First Beach) is probably the busiest and well-known beach in Vancouver. 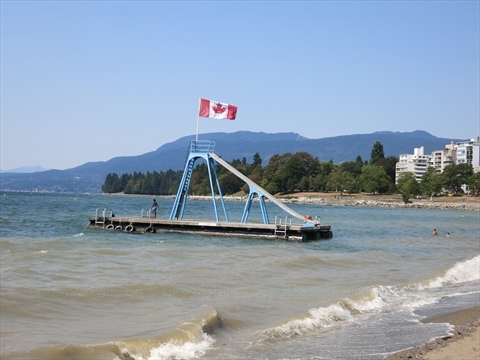 Located right on English bay in the West End neighbourhood of Vancouver, it has been the main beach of Vancouver for over 100 years! 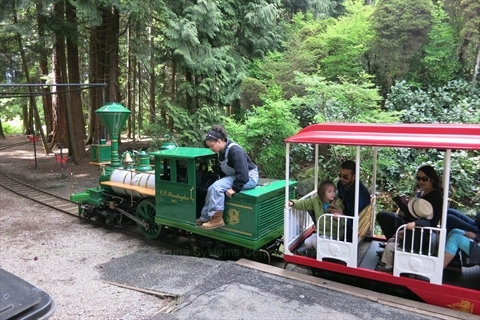 It is very accessible by transit and driving and is only a 15-20 minute walk from the highrises of downtown Vancouver. This is the beach where the famous Joe Fortes taught countless children to swim. There is a monument to Joe in the little park across Beach Avenue from English Bay. As with most Vancouver beaches, there are giant logs laid out parallel to the waterline which provide a wind break and on which you can lean comfortably to sit up. Many people go to the beach to lay or sit in the sun, and in the summer months swim in the ocean. During the summer months, many people swim at the beach. There are changerooms, showers, and bathrooms at the English Bay Bath House right next to the beach. There are lifeguards during the summer months. Also in the summer, there is a giant slide that can be used during high tides! On the beach itself, there are poles that you can affix a volleyball net to. There are kayak and paddleboard rentals right in front of the English Bay Bath House. 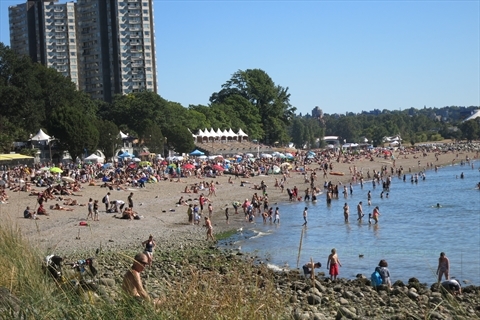 English Bay beach is host to some of Vancouver's most popular events. 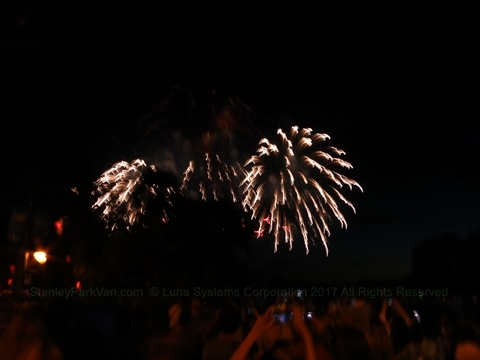 In the summer, there is the Celebration of Light Fireworks and Festival which hosts 3 nights of fantastic fire works. On New Year's Day, thousands of crazy people go for a quick swim in the ocean as part of the world famous Polar Bear Swim! 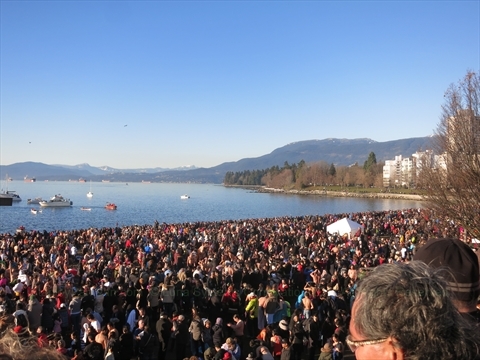 For all these events, English Bay beach is packed solid with people! 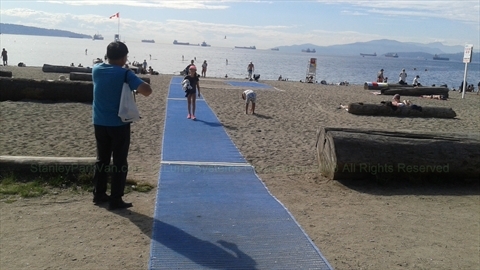 In 2017, the Vancouver Parks Board installed a wheelchair accessible beach mat that gives people in wheelchairs the ability to go out onto the sand down to the high-tide water line. This is a pilot project on English Bay beach and may be extended to other beaches depending on what is learned from this pilot. There are 2 beach wheelchairs that have large wheels that can be rolled on the sand, but these need to be reserved in advance. Dogs must be leashed when on this beach. 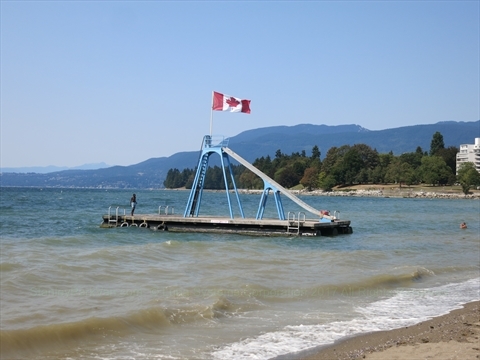 Where is English Bay Beach? English Bay beach is the located on English Bay in Vancouver, BC, Canada. 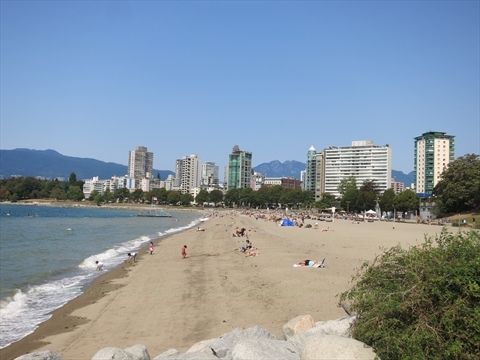 The address of English Bay Beach is approximately 1800 Beach Avenue, Vancouver, BC, Canada. This is at the intersection of Beach Avenue and Denman Street in the West End of Vancouver, BC, Canada. Where can I park near English Bay Beach? There is no parking lot at English Bay Beach. 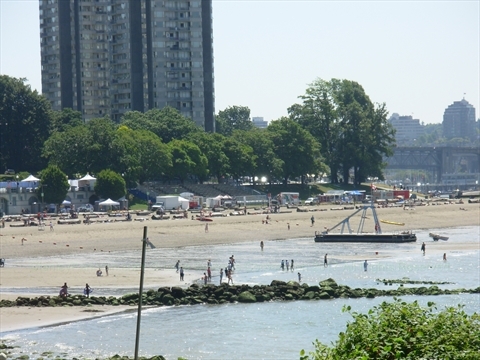 There is meter pay parking on the main streets near English Bay beach. There are a couple of parking lots along Beach Avenue near Sunset Beach. Can I get to English Bay Beach by transit? Yes, there is a bus route that runs both ways along Davie Street and Denman Street. The corner of these streets is one-half block from English Bay beach. What things are near English Bay Beach? The English Bay Seawall runs the length in front of English Bay Beach. The Cactus Club Cafe and English Bay Bath House are in front of the Beach. Across the street is the A-Maze-Ing Laughter statues and the Sylvia Hotel.